You can read our standard procedures for our work here. Artificial turf has become very popular over the last few years. It has become far more realistic over the last 10 years, with good quality turf using a variety of blade colours and thicknesses and usually have a brown ‘thatch’ sewn into the base of the grass. This aims to directly replicate real turf. It is ideal for dog owners (as it can be washed down easily), people who want to reduce the amount of maintenance in the garden, or people who like to play a lot of sport in the garden. Cleaning of patios and drives can make a huge difference to your property. We use a high pressure hose to remove debris and return the surfaces back to their original colour. Sealant can be applied to surfaces in order to protect them from weathering and to make them easier to keep clean. Decking is very versatile. It can be laid to form many types of pattern, it can be suspended over an area and different levels can be created easily. Hardwood and softwood timber can be used, both with a life-span exceeding 20 years and comes either grooved or plain. Various maintenance issues apply to the different types of decking, as some need treating and some do not. We undertake all types of fencing such as traditional garden fencing, chain-link fencing and wire fencing. The gates we install are very varied from softwood garden gates to hardwood driveway gates. Take a look at our fencing trellising and gates gallery. Front gardens very much vary in size and can be designed and landscaped accordingly. Low maintenance is a priority for most and this can be achieved, along with adding colour and style to your front garden. We often landscape front gardens when renewing your drive. Take a look at our front gardens gallery. Designing a garden from scratch can be a challenge and it’s often difficult to know where to start, as Beautiful Gardens have vast experience in all forms of garden design we can easily adapt with our surroundings and create beautiful gardens with our in-house garden designers based in Lichfield. 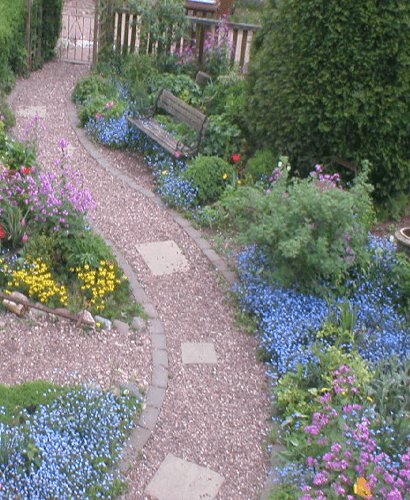 Redesigning an existing garden, a part of the garden or just one flower bed can prove to be tricky. This is why we have in-house garden designers who can help you come up with various garden designs and then choose the best. These are becoming more and more popular as decorative features, mostly to reduce maintenance. We use ‘Plantex’ weed-guard membrane beneath all gravels, to ensure maximum protection against weed growth. We can plant areas and add features, rocks, water features etc. to create any style you choose. We offer a huge range of play equipment from play-houses to sand pits to slides, outdoor games and sensory equipment. We can add individual items, or alternatively, we can design and landscape entire play areas. We can lay play surfacing, including bark chippings, rubber compound bark, turf, and so on. This is installed by our team, along with the equipment. Fencing, hedging, planting and other associated tasks can also be completed by ourselves, as part of our comprehensive play equipment service. Pathways and steps can be added to complement existing landscaping in all sorts of environments. Areas can be brought to life by adding simple paths whether it be through parks, woods, open areas, scrub land or around your building.Surfacing can range from tarmac, self-binding gravel, loose gravel, bark chippings, block paving, slabs etc. We lay thousands of square metres of slabs every year. Our preferred slabs are natural sandstone or limestone slabs. These come in a range of 8 different colours and come in a range of different sizes. They are cheaper than most concrete slabs and are more durable, more attractive and natural, rather than manufactured. We will happily lay whatever slabs you ultimately choose and can create a large number of styles and designs from combining paving with other features. Pergolas and arches can make a huge difference to the overall feel of a garden. 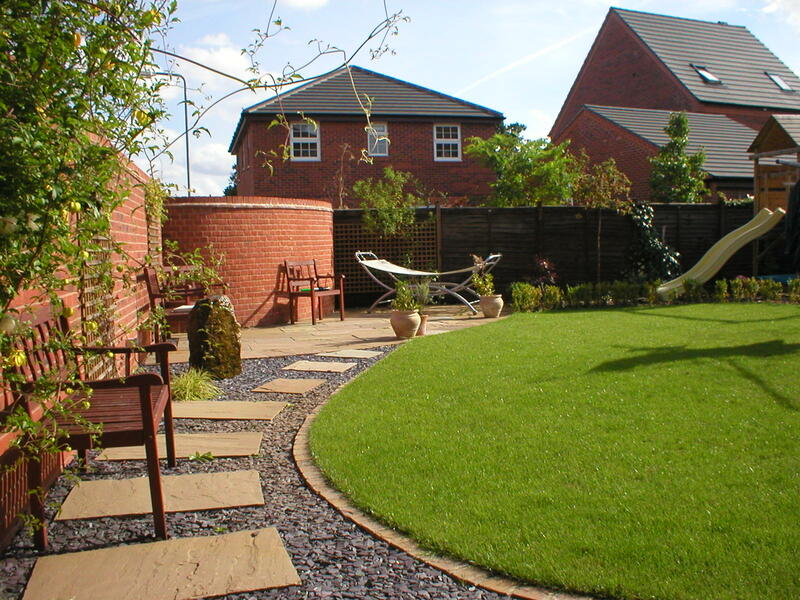 They can be used to add height, focus or extra detail to an otherwise ‘flat’ garden. They can be either wooden or metal, contemporary or traditional and truly add to the garden. we carry out many different walling projects to suit your requirements. Retaining walls can be built using a variety of materials from standard bricks, reclaimed bricks, natural stone bricks, rendered walls, block walls or sleeper retainers. Copings also vary from brick to slab to stone or concrete. We can build small ornamental walls through to structural retaining walls. There are a huge range of water-features available from natural stone, stainless steel, copper, resin or wood. These can be lowered into the ground or sat on top of slabs, depending on the feature you choose.